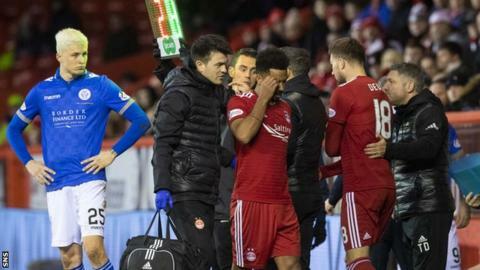 Aberdeen full-back Shay Logan will miss between two and three months after having surgery on an ankle injury, says manager Derek McInnes. The 31-year old limped off during the Scottish Cup win over Queen of the South earlier this month. Speaking before Wednesday's Premiership visit of Hamilton Academical, McInnes says he hopes to sign an out of contract defender by the weekend. "We're making progress on one or two things," he said. "[Shay] has had his operation now - we didn't want to waste any time and we had to resolve the tendon issue. "Hopefully we can get someone in for the weekend because I think we are a bit stretched. The board are supportive of that if we can get the right person." Watford loanee Tommie Hoban is out for the season, but defender Scott McKenna is back from suspension for the game with Hamilton.